The 2016 Subaru WRX and WRX STI receive technology updates for their second model year. Subaru's new navigation system is available, and WRX models can now get Subaru's excellent EyeSight suite of driver-assist technologies like adaptive cruise and collision warning. STI models can now be equipped with blind-spot detection, and you can order a smaller-profile rear wing. Fun and reliable wry-can't go wrong with any Subaru! I have owned several wry and it is. I preferred the hatch back and hoping they come back. I was interested in another wry in white. A gently used 2016 base was affordable and I later upgraded to add heated seats from the dealer which seem to warm up quicker than the preinstalled factory ones. It has been reliable & comfortable. AWD and 6 speed manual make it easy to drive in all weather conditions including snow. Lots of hp and speed, good torque, turning radius. Comfortable on long drives-cruise control makes long drives bearable. For a sedan it is roomy with enough leg space. Seats fold down if needed. I have been able to fit 4 spare wheels in the trunk with the back seats down. Dash and console are visually appealing and allows for usb, Bluetooth , Pandora, etc. Backup camera is good, but I have seen later models that are more detailed with your vehicle's position. 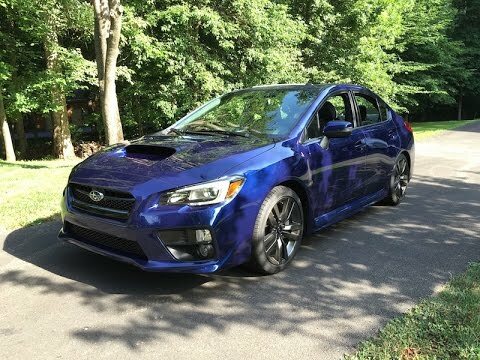 I will always buy Subaru as all previous models I have owned have been reliable, comfortable, and fun if you like speed. Performance in all types of weather would not buy any other vehicle for year around driving. Problems that have happened is engine failure due to Subaru using less inferior parts. I bought this car because I really like the design and the performance that it has no matter what the weather is. The car is really reliable once everything is set on it. Performance mods do decrease reliability but people who generally buy these cars mod them. The car has many features and the comfort is nice but the inside is still basic but for a performance car a luxury interior is not expected. This is my 4th Subaru in 14 years. 2 outbacks and 2 WRXs. Reliable family car but quick racing when needed. I love my Subaru, and it is the only brand of cars I have ever owned. The 2016 model is amazing and has plenty of room for my kids in the back, and very comfortable all around. The back up camera is a life saver, I just wish there was an audible sensor for it. While the performance is not as strong as my previous wrx, it still has good kick when it needs it. I absolutely love Subaru cars and they are always my first pick when I am shopping.